The 2nd ENOC Bureau meeting took place on 18 March 2018 in Brussels, Belgium. Discussions and decisions were mainly related to the state of progress in the implementation of the ENOC work plan for 2018 and required further action. The ENOC Bureau also discussed and made recommendations on pending membership applications, discussed finances and details on the EC Operating Grant for 2018. On the same occasion, the ENOC Bureau met with young people from Ireland and Northern Ireland who participated in a project called “It’s our Brexit Too: Children’s Rights, Children’s Views” carried out jointly by the Ombudsman for Children’s Office (OCO), Ireland and the Northern Ireland Commissioner for Children and Young People. Young people presented the outcomes of the child/young people participation project involving 120 young people from both sides of the island and aiming to look at the impact of Brexit on different areas such as free movement, education, health, child protection, etc. affecting directly children and young people’s daily life and future. On 19th of March 2018, the ENOC Bureau held a number of meetings with different stakeholders. It first met Ms. Jana Hainsworth, Secretary-General of Eurochild. 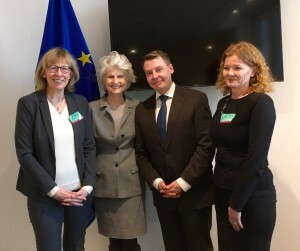 The two organisations agreed to an annual exchange to coordinate advocacy efforts on children’s rights in Europe and invited each other to take part at their respective Annual Conferences. The ENOC Bureau met with Mr. Vytenis Andriukaitis, European Commissioner on Health and Food Safety to discuss (children’s) mental health, early vaccination and child obesity. The Commissioner presented the EU Compass for Action on Mental Health & Well-Being involving twenty five EU member states, plus Iceland and Norway. One of the focus areas of the Compass is mental health in schools in terms of prevention of depression, suicide and bullying. Regarding early vaccination, Commissioner talked about increased resistance by parents and other actors due to poor information and fake news circulating. The Bureau has been informed that the European Commission is preparing a proposal for a Council recommendation on Strengthened Cooperation against Vaccine Preventable Diseases. On the child obesity front, the Commissioner invited Ombudspersons for Children to increase their efforts in informing and involving children and young people in the design of a healthy lifestyle. Further meetings have been held with the EC Coordinator on the Rights of the Child, Ms. Margaret Tuite to discuss near future plans of the EC (until end 2019) in the children’s rights area and an introductory meeting with Mr. Emilio Puccio, Coordinator of the European Parliament (EP) Intergroup on Children’s Rights. In late afternoon, members of the Bureau met with MEP Anna Maria Corazza Bildt, Co-Chair of the European Parliament Intergroup on Children’s Rights, the largest intergroup within the EP. They shared most recent and relevant information on their respective activities and agreed on a regular and enhanced cooperation and coordinated action on issues of common concern. ENOC formally applied to be part of the Intergroup.